Elk Studios has become a prominent interactive gaming software developer within the online and mobile gaming industry, designing unique and immersive casino titles that are proudly featured on some of the most reputable and established Internet casinos. Let’s take you through some of the designer firm’s top casino pokies games. Elk Studios was established in 2012 but did not release its first set of casino pokes games in 2014. The gaming provider prides itself on quality over quantity, having released far fewer pokies titles that some other big names such as Microgaming and Net Entertainment, but ensuring every game released demonstrates stunning features and design, while at the same time delivering high quality entertainment. Elk Studios has also built a strong reputation with a ‘mobile first’ initiative – providing graphically and visually advanced mobile and tablet compatible pokies games that are not watered down at all. The company places a chief focus on the concept, art and maths of each and every game it develops. The Lab: One of the most played and enjoyed Elk Studio games, The Lab was the first game released by Elk Studios, back in October 2014. 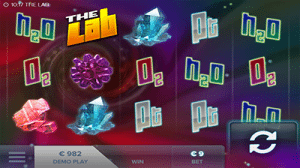 A classic five-reel pokies title, it is set against a science-space backdrop with awesome back-light effects, crispy molecules and sound effects. Hit the Lab symbol and two extra reels will pop up to increase your chances of winning. DJ Wild: Specifically built for the mobile gaming platform, the symbols in this five-reel x three row video slots cover the entire screen. Featuring re-spins, sticky wilds, expanding wilds and a jackpot wild symbol, play this high volatile pokies game to the awesome beat of the Fantasize soundtrack – created by one of the hottest DJs of Stockholm. Champions Goal: This is a classic five-reel x three row football video slots game that boasts scoring scatter symbols, striking win pay lines, imploding free kick re-spins with multipliers, derby free spins, cascading tifos and sticky corners. Hit the full power supporter bonus game and you will have the chance to win the maximum payout. 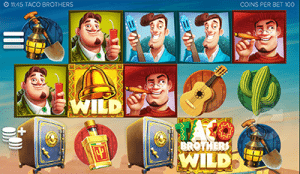 Taco Brothers: This five-reel pokies game boasts 243 ways to win and is set in the beautiful village of Santa Maria, Mexico. With a uniquely Mexican and taco flavoured theme, attempt to keep away the evil Captain Diaz who arrives to steal all the tacos and pesos from the innocent people. Check out the Taco Brothers Christmas special, too (Taco Brothers Saving Christmas). Poltava: Poltava is the battle of 1709, where the Swedish army was defeated by Peter the Great. This five reel x four row video slots title showcases an epic introduction video clip to re-tell the historic battle, and then provides a gripping backing soundtrack with stunning graphics to keep players completely immersed. Keep an eye out for the Marching Reels re-spin feature, where troops move from reel to reel to build up some huge winning combinations. Elk Studios has integrated unique betting strategies into its pokies games, to add to another level of interactivity, and these strategies work in conjunction with the auto-play feature available in all online and mobile casino slots titles. The strategies are predefined betting patterns that force your bet to automatically change, dependent on a set of rules. Players can alter or turn off the betting strategy after any bet. The Jumper: Raises your bet level by one after every win, until you’ve reached four levels above the base level wager. The bet level resets to base level after any loss. The Leveller: Raises your bet level by two levels after five consecutive losses, and again by two levels after another five consecutive losses. The bet level resets to base level after any win. The Booster: Raises your bet level by one after every loss, until you’ve reached four levels above the base level wager. The bet level resets to base level after any win. The Optimiser: Your bet level will automatically change, based on the selected percentage of your balance (adjusts up and down to the closest bet level below the selected percentage). Play around with the strategies to see which you like best, with this level of flexibility unseen in any other Internet video pokies titles. Below are some of the top rated Internet casino games sites that offer Elk Studios games, in both the real money format and within the practice play money format. Each site is licensed in its appropriate gaming jurisdiction, and is regulated by gaming governing bodies such as the UK Gambling Commission and the Malta Gaming Authority, and by player protection and testing agencies such as eCOGRA (eCommerce Online Gaming Regulation and Assurance). Access these casino sites and register free accounts directly via your Web browsers by opening our links from your desktop, laptop, mobile phone or tablet, and you will be able to make the most of the new player welcome matched deposit bonuses, along with several other exclusive player promotions, competitions and tournaments.